Sunderland Harrier Eve Quinn, who is in fifth place in Grand Prix. The North Eastern Grand Prix is back on track tonight at Monkton after the fourth meeting of the series was cancelled. Like many other sporting events up and down the country, the England World Cup semi-final took precedence over the athletics fixture. Tonight will see the penultimate meeting and the Grand Prix is now at a crucial stage for those athletes involved in the chase for prizes. The Start Fitness awards are given to the first six in each age group and athletes must have competed in at least three events to be eligible. Houghton Harriers and Sunderland Harriers have a number of athletes in contention for prizes throughout the age groups. Houghton have two athletes leading their categories in Under-11 – Carl Charlton and Senior Man – Phil McCluskey. The full list of Houghton Harriers is: Under-11 – 1st Carl Charlton, Under-17 Women – 5th Lydia James, 6th Courtney Clark, 8th Anna Pigford, Under-17 Men – 3rd Henry Johnson, 10th Will Bellamy, Under-20 Men – 2nd Cameron Allan, Senior Men – 1st Phil McCluskey. Sunderland Harriers’ contenders are: Under-17 Men – 7th Andrew Rhodes, Under-20 Women – 5th Eve Quinn, 9th Sarah Knight, Senior Women 6th – Anna Harris. The prize presentation will be at Gateshead Stadium on Monday, October 1, at 7.30pm. The programme tonight includes 100m, 200m and 1,500m, shot, discus, high jump and hammer. The meeting starts at 7pm. After the successful promotion of their Penshaw Hill race and the Sunderland 5km, Sunderland Harriers are now hard at work in planning their Farringdon Cross Country event on Saturday, September 1. There will be one major change to the event, as it will now be known as the Ken Jefferson Memorial Farringdon Cross Country. The club middle distance coach passed away in May, aged 71. The Harriers’ committee decided to rename the event in Jefferson’s memory as it was one of his favourite events in which he attended throughout its 36 year history. The cross country event takes place on the fields behind Farringdon Academy and caters for all age groups and both sexes. It is an undulating course over approx 3,000m with a stream to cross. The programme is: 11am Event 1 – U11 Boys and Girls: 1,000m, 11.15am Event 2 – U13 Boys and Girls: 1.8 miles, 11.30am Event 3 – U15 Boys and Girls: 1.8 miles, 11.45am Event 4 – U17 Men and U17 Women: 1.8 miles, 12noon Event 5 – Senior Women’s and Veterans Relay: 3x1.8m, 12.45pm Event 6 – Senior Men’s and Veterans Relay: 4x1.8m. If interested in taking part, send entries to Glenn Forster, 5 Beldene Drive, Sunderland, SR4 8QD, or call 07941534226, or enter online at@ SportSoft On Line Entries. Penshaw Hill Race winner Kurt Heron added another race to his list of honours this season with victory in the Northern Front Runners 5km at Newcastle’s Town Moor. The Ashington Hirst athlete recorded 15.53 for an emphatic victory over Blaydon Harrier George Rudman (16.44), with Ryan Holt (Tyne Bridge Harriers) third (16.46). Sunderland Harriers were led home by Steve McMahon, who has been trying all season to beat two minutes for 800 metres, in fourth (17.00). Steven Duffy was ninth (18.07), 57-year-old Paul Collins was 14th and first Over-50 (18.32), compared to his 17.17 clocking in the Sunderland 5km ten days previously. Training mate Steve Gordon recorded the same time in 15th for second Over-40 and Darren Dodd was third Over-40 in 17th (19.04). 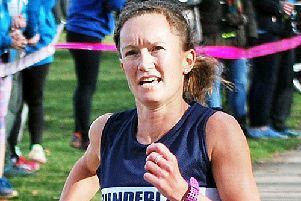 Gateshead Harrier Michelle Nolan was first woman in 20th overall (19.12). There was 698 finishers. The North Eastern Harrier League’s Annual Meeting will be held at Jesmond Pool, St George’s Terrace, Newcastle-upon-Tyne, NE2 2DL on Friday, starting at 7.30 pm.